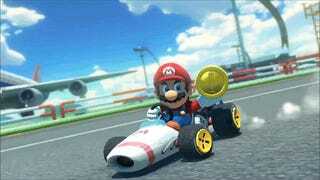 Slowly but surely, it looks like Mario Kart 8 is shaping up to be the game it was always meant to be. First, Nintendo delighted fans with the announcement that Zelda and Animal Crossing were making their way into the game. And now they're sweetening the deal with a classic car from Mario Karts past: the B-Dasher. According to a Miiverse post, Nintendo will release the next-gen version of the B-Dasher alongside the other DLC for the game, which was previously announced in August and is slated for a November release. Dunno about you, but I'd take this bad boy over a Mercedes Benz any day of the week.